Ackeelover Chronicles: Who's zoomin' who? Terrorism made September 11th a date none of us can forget. For entirely different reasons this year, residents of Toronto have incentive to set digital reminders or circle the date on calendars. That day is the end of registration for the job of Mayor of Hogtown, the entirely unflattering nickname that has stuck to this sprawling, metropolis. Actual Election Day is October 27th. Incumbent Mayor, Rob Ford has, during his tenure, acquired a prodigious level of international media notoriety, solidifying his status as head hog. His campaign for re-election is fueled by an unlikely anti-hero aura, eclipsing any moral authority of civic oath, which threatens to undermine all opposition as well. 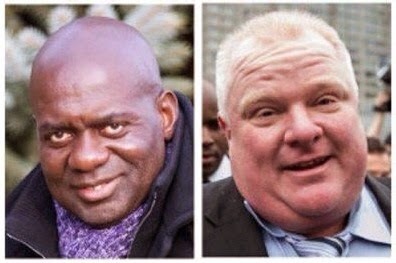 Themes of understanding, rehabilitation and redemption are invoked by Ford Nation spin-doctors. Team Rob posits that no individual is entirely infallible, and this man's foibles are his own, providing they don't impede execution of official duties. To court like-minded support, he's aligned his aspirations to an iconic constituent whose travails are comparable. "Big" Ben Johnson surely knows this territory more than most. September 24th 1988 is another one of those dates we easily recall. Our hearts thumped at the sight of our likely-lad humbling Carl Lewis, and an elite Olympic sprint field, before the world. Shame, scandal and steroids summarily rescinded Ben's gold medal, and his world records, but couldn't disqualify his sport-celebrity, albeit tainted, due to the giddy high of glory. Energy put into what has to be seen as cheating, realised a goal in Seoul, and what was done couldn't be comprehensively undone. Indeed, just as our bellicose burgermeister seeks a second term at City Hall, so too is Ben afforded another chance. Personal ambition and a public unwilling to pass up a thrill, continue to offer opportunity. In a previous manifestation of this phenomenon I fell into the vat of adrenaline, excitedly running behind Ben in a field full of horses, when that comeback trail passed through an episode of Neon Rider. Featuring a redemptive storyline, the show was titled "Phoenix." Come to think of it, that's a word the Mayor's camp could use, in acknowledgement of the damage Mr. Ford's behaviour has done to his career, and signal an intention to transcend. But strategy seems to be more-of-the-same, which could sink the ship. Still, with tabloid mentality in the mix, plebiscites can be unpredictable, so we watch as the thick-skinned Ford forges on. What's entirely possible is that celebrity survives the vote and revives at some point, in another form. On reality TV perhaps? A spot on "The Biggest Loser" or "Hog Dynasty" anyone? Ben Johnson meanwhile (nobody's fool if you take my word for it) maintains profile and lines up for a prominent personal trainer challenge to add to his Maradona and Ghaddafi credits. Comments Welcome. All comments previewed before publishing. Thanks for reading ACKEELOVER CHRONICLES. ... like you ... some ups, some downs, some wins, some losses, some dreams, some secrets, some lies ... and blessed ... this actor's journey between the last gig and the next is a chance to chronicle personal perspectives, for fun and creative release ... the Jamaican genesis of my worldview tells me to always look at horizons if only to know where they are ... I carry that with me wherever I am, write Ackeelover Chronicles whenever I'm moved to do so, and believe in a benevolent moving spirit!